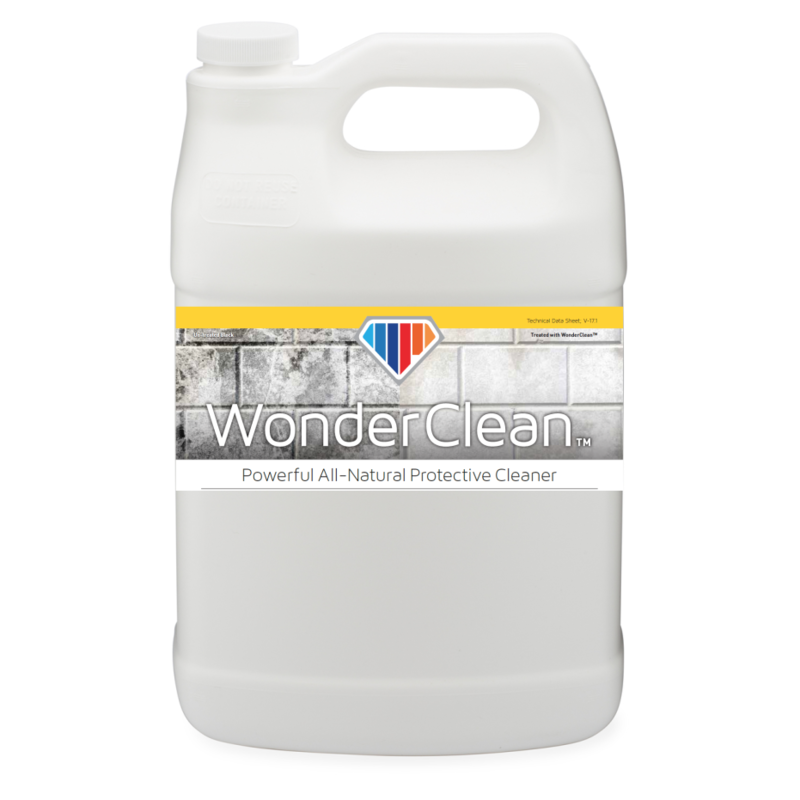 WonderClean™ is an all natural versatile cleaning concentrate that is tough on dirt, grime and discoloration while eradicating mold, mildew, and most known germs and bacteria. WonderClean™ provides a penetrating and protective coating that eradicates and prevents contaminants from returning. Unlike chlorine bleach products, WonderClean™ leaves a protective barrier that prevents the regrowth of mold and mildew for weeks. Use it as a one-stop cleaning agent where stopping infections agents is priority number one. WonderClean™ is the perfect, natural solution to prep surfaces before using WonderPaint’s primers and topcoats, and to eradicate mold, mildew and dangerous infectious agents for good. WonderClean™ is people, plant and pet friendly. It is all-natural, non-toxic, biodegradable, water-soluble, and free of Volatile Organic Compounds. The active ingredient in WonderClean™ is Monolaurin, which is on the FDAS “Generally Regarded as Safe” list, and is used and food production and health supplements. 100% SATISFACTION GUARANTEED We stand behind all of our products with a 100% Satisfaction Guarantee. When applied properly and under normal circumstances we are confident that you will be satisfied. LOW MAINTENANCE WonderClean™ is extremely low-maintenance and easy to use. For most contaminated surfaces, you just spray it on, let it sit and wash it off. No excessive scrubbing required. BIOREMEDIATION CLEANER WonderClean™ is useful for cleaning almost any surface. It is powerful yet gentle and safe. The active ingredient kills bacteria, viruses and other disease causing organisms. LASTING PROTECTION WonderClean™ leaves a temporary coating that protects the surface from mold, mildew and fungal growth in harsh high humidity environments for periods of 20 to 35 days, or longer. ENVIRONMENTALLY FRIENDLY, ANTI-FUNGAL, ANTI-MICROBIAL WonderClean™ is environmentally friendly, non-toxic, readily biodegradable, non-flammable, free of Volatile Organic Compounds and safe for the environment. WonderClean™ contains ingredients that make it impossible for mold or mildew to grow for a period of several weeks after application, which helps protect the integrity and appearance of the surface.